The Houston Rockets are not here to mess around. James Harden and his teammates had a chance to make a statement in game one of the 2019 playoffs, to set the tone for their expectations going forward. In retrospect, there was nearly nothing more they could have done to show the world exactly what they aim to do. 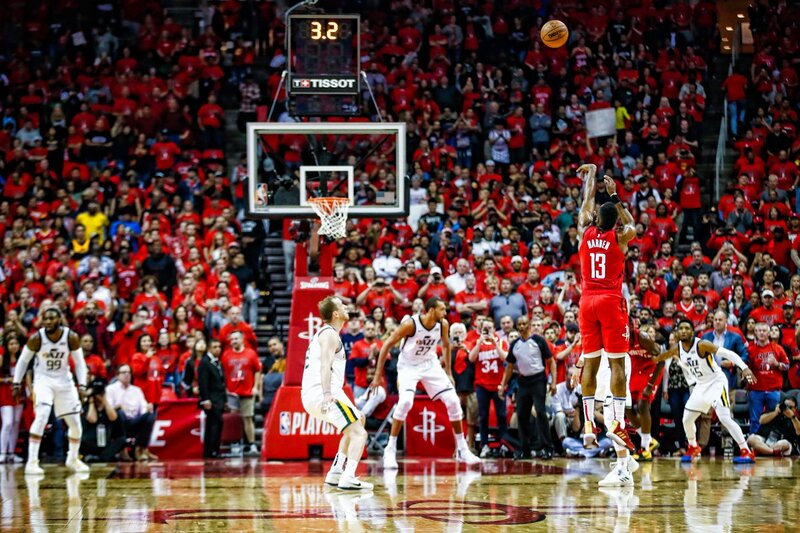 The Utah Jazz came to Houston only to be absolutely buried by the Rockets in a 32-point victory that can only be read as a statement of intent. In case it's not eminently clear, the Rockets intend to win a championship this season. About a year ago, this looked like an obvious conclusion and a likely proposition. Five months ago, as the Rockets foundered on the shoals of a new season, such a prospect seemed a pipe dream at best. Tonight, the Rockets have done an excellent job in showing the world just how plausible that goal still is. Against one of the hottest teams in the league over the last few months, the Rockets made a game between two teams with close odds look like a clear favorite taking care of business. There's a lot of series left, and even more playoffs, and the Rockets have a long way to go before they get where they want to be. They have, however, laid out a marker showing exactly where they want to be and exactly how ferociously they're willing to fight to get there. The most terrifying stat from this game isn't the 90 points Houston allowed the offensively competent Utah Jazz nor the dizzying 122 they put up themselves. 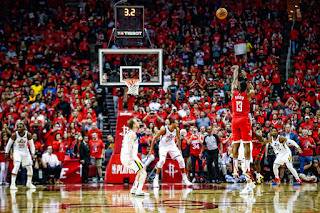 No, the terror for Utah should be that Houston attempted a mere 12 free throws to Utah's 27, with James Harden himself taking a mere three attempts from the charity stripe. This discrepancy from Harden's normal outing (11 per game this season, just .3 less per game since he donned a Rockets jersey) is unlikely to persist every game, and the Jazz shouldn't be favored to consistently shoot over twice as many free throws as Houston. The Jazz have to hope that their abysmal 26% from the three point arc improves if they want to turn this around in a now critically important game two. The good news is that this would easily lift their offense. The bad news is that they only shot 27 three pointers, a number which would have been a flood in any other era. If they had shot 37% of those threes, in range with the 36.6% Houston shot, they would have added maybe 9 points to their score. Perhaps this variance would have allowed the tone and tenor of the game to move in a direction more conducive to their play, or perhaps they simply would have lost by 23 instead of 32. It's impossible to know, but it remains a place the Jazz can hold onto hope. With Utah standing firm by their plan to shade Harden to his right and in fact play behind him at times in the same manner the Milwaukee Bucks did in the regular season, there's reason for them to think they can clean it up and come back to take this series. There's also reason to believe they can do so. This is a disciplined, talented and skilled team that must be taken as a real threat to any team in the league. There's also reason to suspect that the Rockets can clean it up, themselves, and be an even tougher out. With Danuel House Jr. looking like a perfect fit on both sides of the ball an with Chris Paul looking more like Chris Paul every day, the Rockets must be counted as at least as scary as Utah. Critically, the Jazz are the ones who must look for hope, and not the Rockets. Which Houston could come back from a game one loss just as well as the Jazz could have, the reality is they aren't the ones on their back foot now. Nothing is over after one game in the playoffs, but needing to win three of six is far better than needing to win four. If the Rockets truly are a contender this year, if they can in fact beat the most talented team in NBA history in round two, this is the sort of game one they would choose. There were no red cards for the Rockets, and likely not even anything as bad as a yellow card. They have a goal, they have a path, and they have a map. Now, with this unequivocal win over the Utah Jazz, they also have a statement of their intent. They intend to replay this evening fifteen more times in the playoffs. The rest of the league needs to be careful to make sure they don't.